Kids love science! 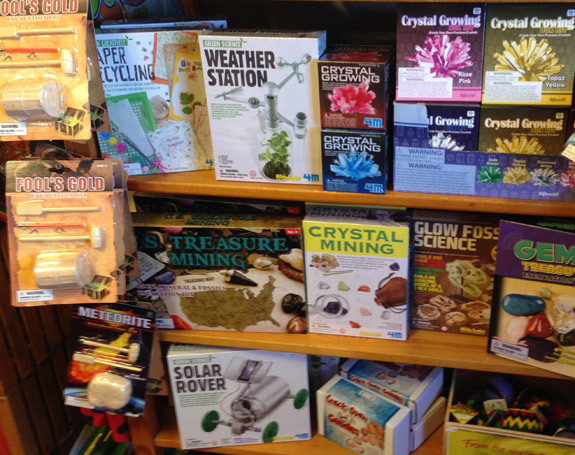 The Backyard Naturalist has a wide selection of earth science themed activities for children of all ages in store! Learn about our planet while having fun. 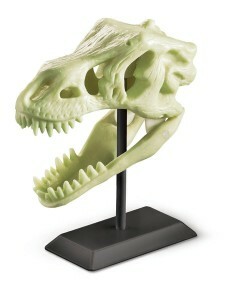 Come see the store selection because we get new items more frequently than we can update here! Also, some items are subject to availability. 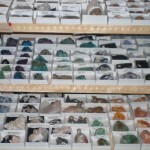 The Backyard Naturalist has the area’s largest rock, mineral and crystal selection outside of The Smithsonian’s gift shop! Spark curiosity in a potential rock hound! Start a collection of rock and mineral specimens with your child or grandchild. Introduce rock collecting to younger kids ages 4 and up with an unusual rock specimen and read “Let’s Go Rock Collecting” together. An excellent activity book for ages 10 and up, DK Pockets’ “Rocks & Minerals” has some really fun features, like a Turn-and-Learn wheel with rock facts, a check list with stickers to encourage progress through some great activities, including Grow Your Own Stalactite. 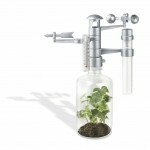 Grow Your Own Crystal Kits. We have several different types. Crack open a Geode to look for crystals inside. Crystal Prisms! Discover the kaleidoscope of colors hidden in natural sunlight. And more in the store! Come see! Give kids hands-on experience, working through simple and intriguing geophysical science experiments. 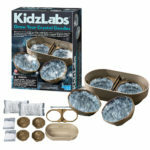 Perfect for children who love to explore and are interested in science, a mining kit is a great way to encourage interest and learning about crystals. Kids excavate, study and display their own beautiful crystals while also learning about them. 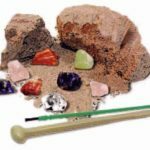 The 4m Crystal Mining kit for kids includes a plaster rock with eight embedded crystals, a digging tool, a brush and a pouch. For ages 8 and up. If you’re looking for a unique project for play dates or indoor fun during bad weather, this kit is hours of fun and a good introduction to earth science. Our newest addition to our selection of crystal science kits is “Grow Your Own Crystal Geode“. Here’s an exciting earth science and chemistry experiment you can do with your kids ages 10 and up! See crystal science in action, as crystals grow right before your eyes! This kit has enough materials to make two sets of crystal geodes and contains chemicals that require active adult supervision. Crystals are used in many things kids see every day, like cell phones, television, watches and clocks. Fascinating stuff! Track weather changes and conduct experiments on the greenhouse effect with your own Weather Station. The multi-function Weather Station kit demonstrates how to track meteorological changes and conduct experiments on the greenhouse effect. Completed station features a thermometer, rain gauge, wind vane and compass. Makes a great science fair project! Kit requires one recycled plastic bottle (not included). Is the sun shining? Charge up your Solar-Powered Space Rover and explore! A great activity set for every budding engineer and scientist aged 8 and up! 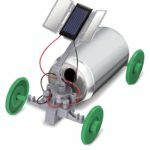 Recycle a used soda can to create an exciting space rover with solar panels that turn sunlight into electricity! This construction set is a super cool educational lesson about electricity — and a great learning example about recycling and alternative energy sources. Green creativity! 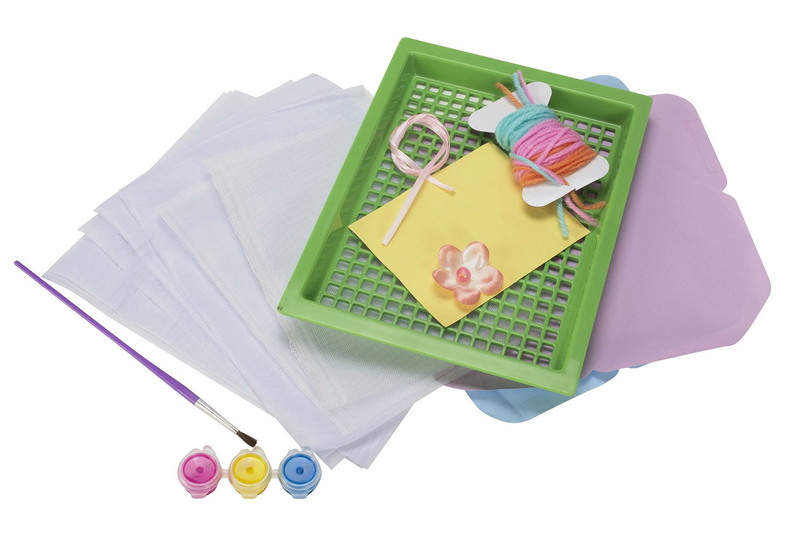 This hands-on kit teaches the craft of paper making and promotes environmentally friendly practice of reusing and recycling. Kit includes 6″ X 8″ mold and deckle, supplies to make different patterned and textured bookmarks, a notebook, greeting cards and more! Recycle! Upcycle! Make your own creative art out of old paper!